In the southwest corner of Yosemite National Park, 240 foot Chilnualna Falls resembles the more well known waterfalls further north around Yosemite Valley, as Chilnualna Creek tumbles over a sheer granite cliff, and although the amount of water is quite low during summer and fall, the surroundings are pretty all year round. 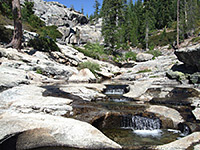 The creek crosses a stark granite landscape forming pools, deep channels, several other falls and many lesser cascades, then after the main drop flows through a wooded valley towards Wawona, where it joins the south fork of the Merced River. The hike to the falls is 4.1 miles in length and climbs by 2,000 feet, so provides a moderate challenge; this, plus the relatively quiet location, well away from the much more popular Yosemite Valley and Tuolumne Meadows areas, means that the path is only lightly traveled, and the falls can usually be enjoyed alone. 12 views of Chilnualna Falls. Chilnualna Falls. Full screen version (15 mb). Chilnualna Falls and Chilnualna Creek (mp4; 1:53 min; 16.8 mb). The Chilnualna Falls Trail starts near the end of the 2 mile side road through Wawona village, forking off Highway 41, 5 miles north of the southern Yosemite National Park entrance station. The road is quite narrow, winding between tall pine trees past several hundred rustic residences and a couple of shops. Trailhead parking is in a small clearing in the woods, and the path begins a little way further along the road. The first part of the path follows Chilnualna Creek to a small cascade, climbs the adjacent rocks via a series of stone steps then veers away from the stream to a signed junction with an alternative stock trail from the road. The vegetation is a mixture of oak, manzanita, cedar and pine, reflecting the transition zone between the foothills and the conifer forest, and remains similar all the way to the falls (an elevation range of 4,200 feet to 6,200 feet). The steep ascent continues as the path keeps fairly close to the stream, through sheltered terrain with only limited views. The ground becomes less steep for a while and the land more open; the trail runs right beside the creek for a short distance before turning away for the last time, zig-zagging up the slope to the north. The west parts of the switchbacks are generally treeless and sunny, while the eastern half is cooler, shaded by large ponderosa pines. The route steepens near the top of the climb, and has shorter switchbacks. 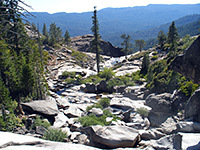 The falls can be seen through gaps in the trees, at the top of a lengthy cliff of light colored granite that extends southwards to Wawona Dome, in contrast to all other directions where the views are of featureless wooded hills. The last half mile of the path stays fairly level, traversing the cliffs to the falls, ending with an exposed section cut into a sheer granite rock face. 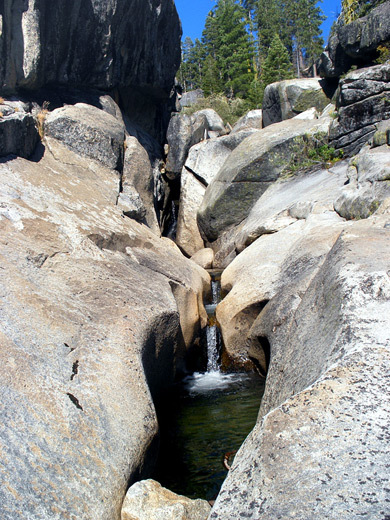 The trail leads nearly to the brink of the waterfall then turns away, bypassing various smaller cascades before returning to the creek after climbing another 200 feet, where it forks; the left branch leads to several places along the Glacier Point Road while the right fork reaches Buena Vista Peak and many other long distance destinations further east. Chilnualna Creek forms a lovely sequence of smooth, circular potholes interspersed by narrow channels and small cascades, ending with the 240 foot falls, a drop which is mostly out of sight from the trail owing to the orientation of the cliff; the best view of Chilnualna Falls is from the top of a granite pinnacle opposite (see panorama), reachable by a 20 minute off-trail scramble around a steep ravine to the south - though the required stream crossing may be impossible at times of high water. The creek can be followed northwards quite easily as far as the trail junction, where the stream also divides; the main branch has several minor cascades leading to the largest pool in the area, set beneath a sheer streaked granite cliff, above which are a series of cascades between potholes - a very pretty scene. 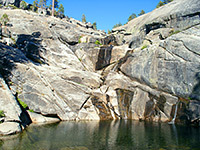 The whole area is photogenic, consisting of smooth, whitish granite dotted with rounded boulders and scattered pine trees. The water in the creek and its pools is clear and cold, good for paddling or wading, and home to many small fish.